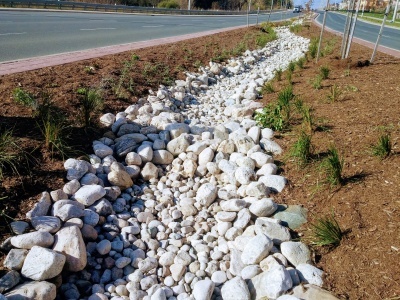 This article is about installations designed to capture and convey surface runoff along a vegetated channel, whilst also promoting infiltration. For underground conveyance which promotes infiltration, see Exfiltration trenches. Enhanced grass swales are a lower maintenance alternative, but generally have lower stormwater management potential. 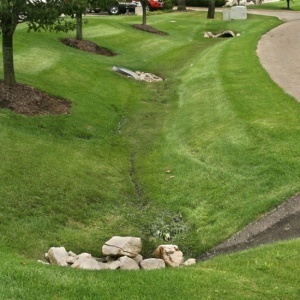 The enhancement over a basic grass swale is in the addition of check dams to slow surface water flow and create small temporary pools of water which can infiltrate the underlying soil. Grass swales are a relatively common landscape feature already and a great opportunity for retrofit, to reduce flow and improve water quality by encouraging settling and infiltration behind a series of check dams. Retention swales can be imagined as linear, sloped dry ponds. They make a relatively little contribution to water volume and quality control than many other BMPs, but they may feature as part of a site-wide treatment train approach. Between 1 - 6 %, check dams are recommended to bring the compensation gradient <1 %. 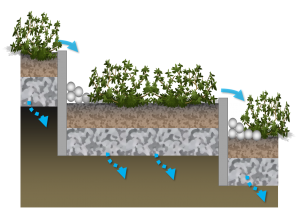 Slopes > 6% can accommodate a series of stepped bioretention cells, each overflowing into the next with a spillway. Distance between dams is determined by equalling the elevation of the crest of each dam, with the elevation of the toe of the upstream dam. 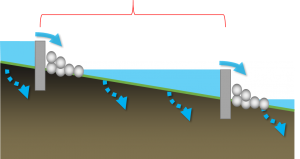 To minimize erosion and maximize the functionality of the swale, sheet flow of surface water should be directed into the side of the BMP. 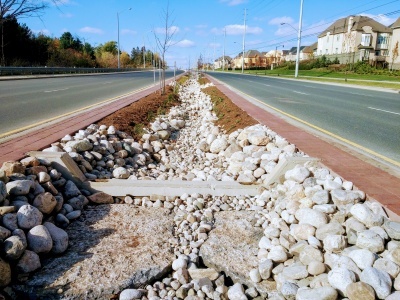 Gravel diaphragms, vegetated filter strips and shallow side slopes are ideal. Alternatively, a series of curb inlets can be employed, where each has some form of flow spreading incorporated. 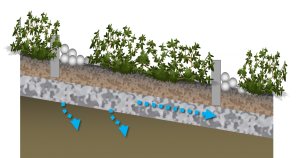 Single point inflow can cause increased erosion and sedimentation which will damage vegetation and contribute to BMP failure. Again, flow spreading devices can mitigate these processes, where concentrated point inflow is required. A review of swale-like practices was published by STEP in 1999. The project page and additional tools are available here. Starting after TRIECA (end March) members of STEP will be undertaking a literature review on the performance of our most popular BMPs. The results will be combined with the information we have to date from the development of the Treatment Train Tool and agreed performance metrics established. Until then, please feel free to continue to ask questions via email or the feedback box below. 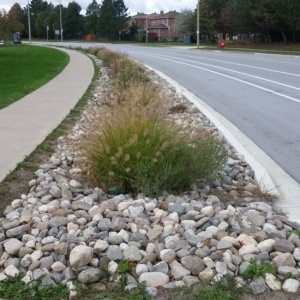 While few field studies of the pollutant removal capacity of bioswales are available from cold climate regions like Ontario, it can be assumed that they would perform similar to bioretention cells. Bioretention provides effective removal for many pollutants as a result of sedimentation, filtering, plant uptake, soil adsorption, and microbial processes. It is important to note that there is a relationship between the water balance and water quality functions. 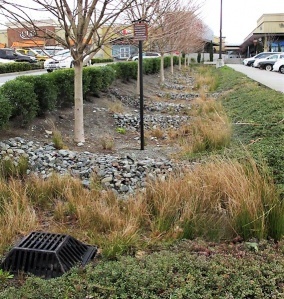 If a bioswale infiltrates and evaporates 100% of the flow from a site, then there is essentially no pollution leaving the site in surface runoff. Furthermore, treatment of infiltrated runoff will continue to occur as it moves through the native soils. Concrete check dam with armourstone to protect against erosion. Concrete colour blends well with surroudning stone. This dam extends to the full depth of the swale and has 25 mm ø weep holes below grade. A check dam in action. ↑ Horner RR, Lim H, Burges SJ. HYDROLOGIC MONITORING OF THE SEATTLE ULTRA-URBAN STORMWATER MANAGEMENT PROJECTS: SUMMARY OF THE 2000-2003 WATER YEARS. Seattle; 2004. http://citeseerx.ist.psu.edu/viewdoc/download?doi=10.1.1.365.8665&rep=rep1&type=pdf. Accessed August 11, 2017.